In the previous post of the series, I discussed my goals for the series and gave a quick introduction on “virtual photography”. Now we’re ready to actually dive in! As I said last time my goal is to produce a tropical beach image — the kind of image that gets you thinking about your unspent vacation time. However, before we can take the image we have to create the environment! Before we actually start, the program I’m using in these screenshots is Carrara 8 Pro. Other programs are available, both for cost (Vue, Maya, and Lightwave, just to name a few), and for free (Blender and POV-Ray). I’ve found, however, that although these programs share the same basic principles and ideas, they differ greatly in user interface, ease of use, and most importantly price. Some artists will try to convince you that one is superior to the others. In my experience, the skill of the user matters much more than the choice of program. Image 1. 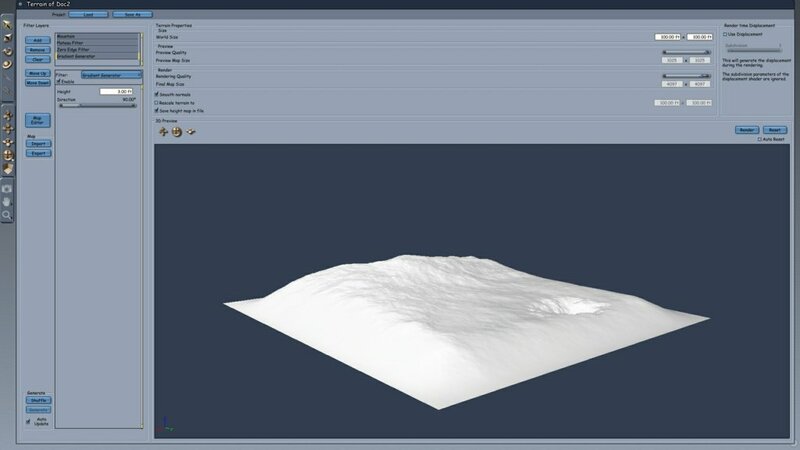 This is the default view of the terrain tool. The starting terrain is pretty random. Ok, let’s get started. Because my intention is to produce a beach scene, I need to create a beach. 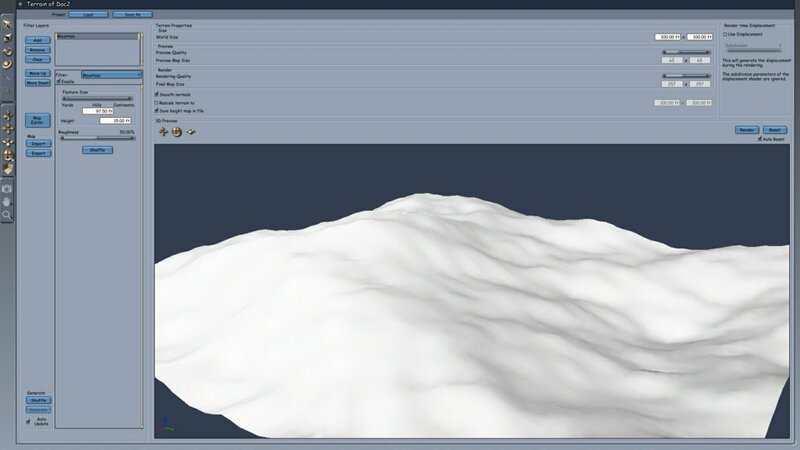 Fortunately, Carrara has a tool built-in to make producing landforms easier. I won’t go into detail on how the controls work; suffice to say, the preview you see in Image 1 is not what I want. Image 2. I like this much better! After some editing I’ve gotten the terrain into a form that I like. Now, looking at Image 2 you might be saying to yourself, “That doesn’t look anything like a beach!” You’re right. But use your imagination — cut off the hill at the edge, as if it didn’t even exist. Put your thumb over the giant crater on the right side of the image… Can you see the gentle slope of the beach rising to the left from your thumb, into the rougher terrain of the coast? (It may help to click on the thumbnail to see a larger version of the image.) If it still looks more like the surface of the Moon than an idyllic beach, trust me. Image 3. The beach is in dark grey, and the ocean is in light grey. 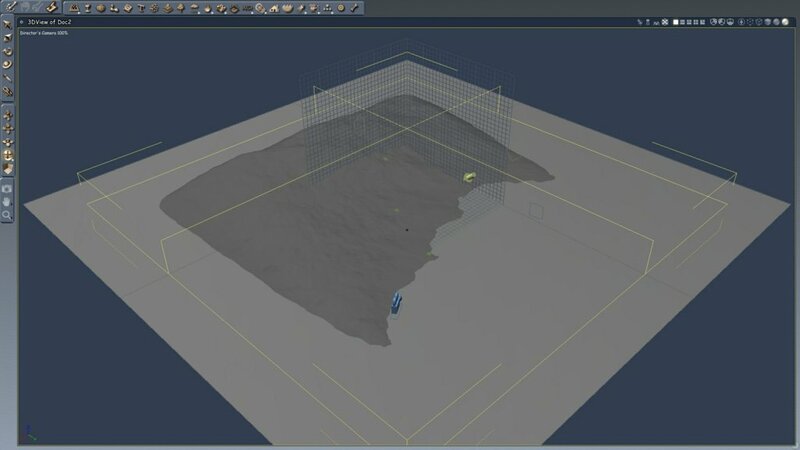 Closing the Terrain Editor, I return to the workspace view. In addition to the beach I’ll need an ocean. Carrara has an infinite plane primitive; as you might expect from the name, it’s big and flat. 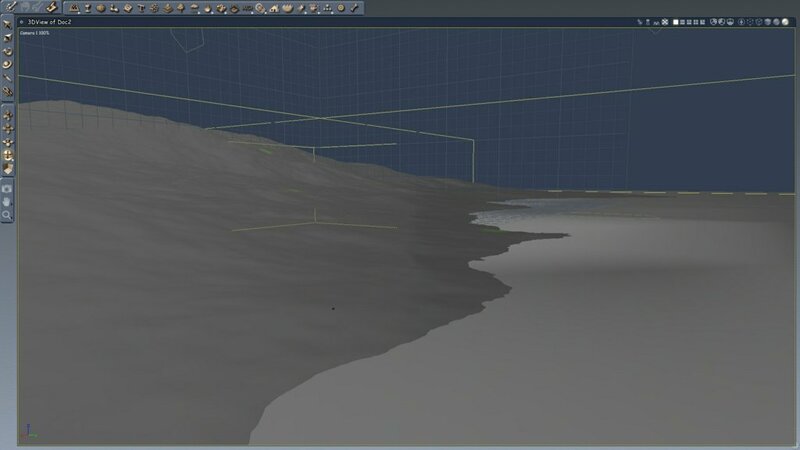 I place that at the zero point of my scene, then maneuver the beach terrain up and down until I like the look of the coastline. Now does it look more like a beach? Image 4. Choosing a starting camera site will end up limiting some of my choices, but it also helps me visualize the final image. Can you see the beach here? At this point I usually start considering possible locations for my virtual camera. As you can see in Image 3, I finally decided on an initial placement at one end of the coastline. I’m almost positive I’ll end up moving it before I’m finished, but it’s a good starting place. Image 4 shows what the scene looks like through that camera. Right now it’s named Camera 1; once I’ve decided that I like the view through it I’ll rename it Production Camera, to indicate that this is the camera that will produce the final image. The base scene is slowly coming together! The drab grey of the ocean annoys me, however, so I’m going to change it. At this point I will reveal a small secret: I’ve only been showing you part of the Carrara interface. My computer has multiple monitors, so the workspace you’ve seen sits on one. On another, however, I have my palette. The palette contains a library of tools, such as shaders and props. Going to the palette, I’m going to grab a simple water shader to put on that big grey plane. Image 5. The palette window is currently showing my water shaders. Shaders are incredibly useful, as they completely control the appearance of an object. It’s more than simply slapping a coat of paint on the virtual object — the shader controls how the object interacts with the virtual light (or even whether it interacts at all). An object’s shader dictates the object’s color, transparency, reflectivity, refractivity, etc. Shading is what differentiates “nice” from a “photorealistic”. However, my current goal is just to get the base scene set up, so I’m satisfied with the relatively simple shader from the palette. 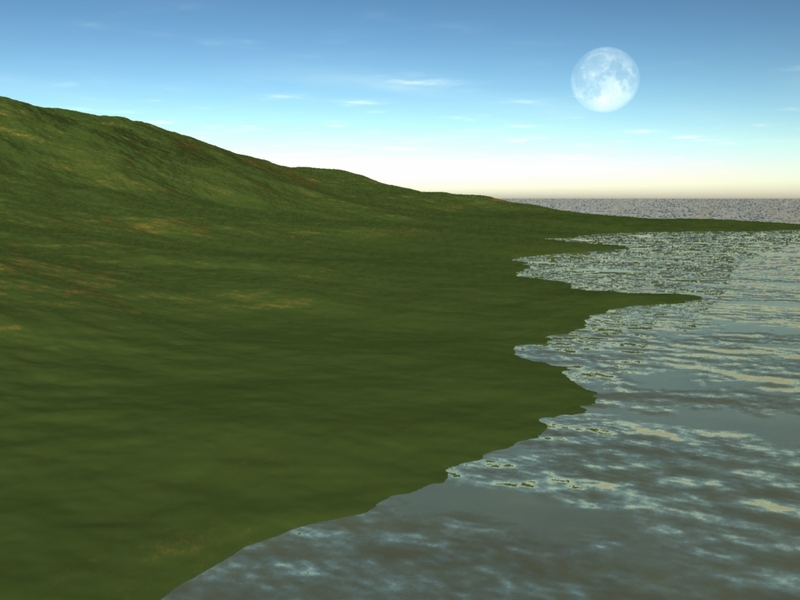 The beach terrain came with a “grassy” shader, so I won’t change it. Once the scene is more complete I will be spending a lot of time tweaking shaders, so I’ll talk more about them then. Image 7. …or with a bright morning. Now I’ve got the land and the sea. The only thing left is the sky. Carrara has an atmospheric “Sky” tool. The tool isn’t perfect by any stretch of the imagination, but it works most of the time for the things I want it to do. For now I set up a basic sky, and just for fun I activate the Moon so that it will be visible from the camera. I’m done! Image 8. Here is what we have so far. Although it doesn’t look like that tropical beach yet, there is definitely land meeting water. At this point I’ve spent about an hour on the image; that’s pretty typical. Going forward, I’ll start adding details. I’ll also decide what I want in the foreground — perhaps a figure sunbathing on a blanket? What would you like to see in this beach image? Give me your suggestions in the comments area below! I love seeing this progression / build of the ocean beach landscape! It also reminds me how much I love graphic design programs – I love software programs that have “tools” to create things … color options and the whole range – but at the same time are we ever complete masters of our software programs? Do we ever know 100% everything there is to know? Reading about Carrara is fascinating … it makes me see the whole animated movie world differently. If I had time I would want to learn it. It seems that in my professional life if I learn anything new it will be Flash … that is something that I can bring into my job … And there are only so many hours in a day. But it’s gorgeous stuff what you do and I can see why you love it so much. Well, I am certainly not a master of Carrara, and I know I haven’t cracked even a fraction of the program’s potential! But your questions remind me how important it is to be open to opportunities to learn new things. I’ve found that I’ve learned the most when I haven’t expected to, in situations where I wouldn’t have anticipated gaining knowledge.